Do you want your pool to be a perfect rectangle, or some other shape? Large enough for laps or small enough to fit on a tiny patio? Many rectangular pools are in fact L-shaped, with a set of steps and a handrail at one end that makes it easier for older and younger swimmers alike to get in and out. For a more organic look, you can choose a kidney shape or even a custom shape designed to mimic a natural lagoon or pond. The shape is the most permanent element of the design, especially when you install a fiberglass pool. To keep the water in your pool from becoming a stagnant breeding ground for mosquitos and algae, you need some type of water treatment system. All pools feature a pump to keep water circulating and fresh. Some use salt treatments to prevent algae and fungus growth, while other use more traditional pool chemicals. You will need to schedule regular swimming pool maintenance to balance the chemicals in your pool unless you pay extra for a fully automated treatment system that continuously monitors the water chemistry. What material do you want surrounding the pool? Will you opt for classic pool tile, or do you want something more modern like poured concrete or stone? This is both a safety issue and an aesthetic issue—the surface needs to have enough traction to prevent you and your guests from slipping when it’s wet. Also, you should decide whether you to install colored pool lights, a mini-waterfall, laminar jets, an attached hot tub, or any other decorative features. 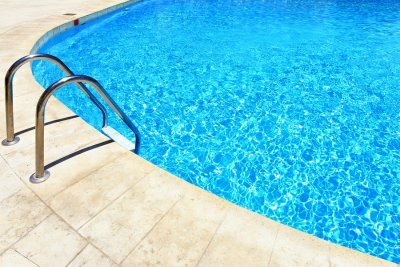 If you take a look at homes in the area, you will see that many of the modern fiberglass swimming pools in Salt Lake City are actually quite small. Older homes may still have traditional rectangular lap pools, but modern swimming pool installations are often designed to mimic the shape of natural ponds or lagoons. Whether you are having a salt water pool or a hot tub installed, consider the size of your lot and the space around the pool. You will need to leave enough room around the edge for lounge chairs, barbecues, fire pits, and any other features you want in your outdoor space. Watch this video for swimming pool design tips that you can discuss with your pool builders. At Deep Blue Pools and Spas, we have earned numerous awards and accolades for our outstanding service. We are committed to your overall satisfaction. Please take a moment to read our latest reviews on Google+ . If you have had a great experience with us, we would love to hear from you. Please leave a review of your own. “I feel very confident in Deep blue pool and Spas to recommend them to anyone.” – Mark S.
test your pool and the experience to know when to add water or chemicals. A swimming pool is much more than a simple reservoir in the ground surrounded by a mosaic of pretty pool tiles. There are many hidden mechanical parts to your pool that help keep it fresh and clean, such as the pump and the filter. You may also have a heater that allows you to enjoy your pool well into the fall and open it early in the spring. During weekly visits, a professional knows how to check and maintain these components. Regular maintenance of all mechanical pool equipment can help you avoid sudden failures and expensive emergency repairs during the summer. Like many non-essential home chores, pool maintenance falls to the bottom of the list when you get busy. You may find yourself neglecting your pool week to week, and then when you want to have friends and family over to use it, you might find the skimmers clogged with dead leaves or see clumps of floating algae. Schedule weekly professional pool cleanings and you can always enjoy a quick dip in your pool at a moment’s notice. There’s nothing quite like having your very own swimming pool at your home. A swimming pool is a great place to get some quick exercise, play with your family, or hang out with your friends. If you have been considering adding a pool to your backyard, you have many different options to choose from. Your pool contractor in Salt Lake City will take you through the steps of designing your pool so that you get exactly what you want. The shape of your pool can be round, rectangular, or a custom shape that works with the flow of your property. Features such as automation and energy-efficient equipment make pool ownership pleasant, rather than a hassle. Take a look at this infographic to learn more about the steps involved in designing your perfect pool. Please share with your friends and neighbors! Among the many swimming pool companies near Salt Lake City, Deep Blue Pools and Spas stands out because of our commitment to top-notch customer service and excellent work. We are a full-service pool contractor, providing all the services you need, including pool installation, hot tub installation, and swimming pool maintenance . Like any respectable contractor, we are licensed and insured, but we go above and beyond the standards to deliver excellence to our customers. For more than 15 years, we have served homeowners of Salt Lake City and surrounding areas. Our work has won various awards, including “Best in Show” for the Salt Lake Valley Parade of Homes in 2012 and “Preferred Pool Provider” for the Utah Valley Home Builders Association in 2014. We also have a high rating with the Better Business Bureau. 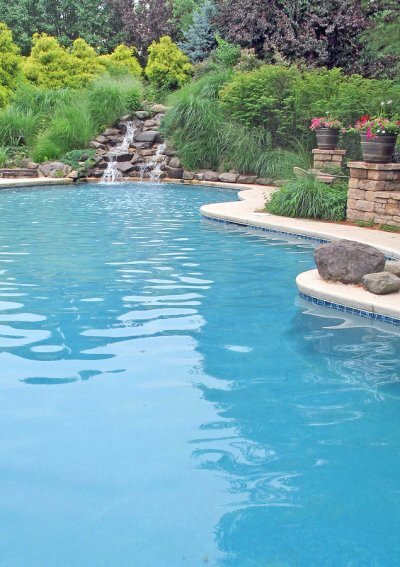 Whether you are a current pool owner who needs to schedule a weekly maintenance appointment or a homeowner looking to install a brand new pool, Deep Blue Pools and Spas will provide you with the best service in Utah.